It took them three days to reach the island. They could have gone faster, perhaps, but after losing two map pieces to the Comte's crew (if the lupe and elephante had in fact been working for the Comte, which seemed likely) Bannok was being cautious. Sailing under cover of night, stocking up on supplies from several sources - never enough at once to betray the fact that they were setting out on a long journey. Comte or not, someone had arrived before them. There was a ship anchored in the bay. It was too dark to hope to identify it, but the low silhouette and the extra cannon ports crammed into the hull were unmistakeable. It was a ship built for speed and battle, with none of the royal markers of a navy ship; a classic pirate ship. Bannok gave the bay a wide berth, careful not to alert the other ship of their presence. They made anchor hidden in the shade of the next headland over. "So what now?" Niettah whispered. "Is this the point where we storm the ship and have a pitched sea battle?" The other two looked at her oddly. "What books have you been reading?" Sam asked. "There's two of us, in case you haven't noticed. Sorry - three. And we don't have any cannons." "We go in quietly," Bannok said. "One person. First priority is to find the map, maybe even find the other pieces as well. Second priority is sabotage. Disable the cannons, cut the rudder, anything that will stop them following us." He fixed Niettah and Sam with a stern look. "No heroics, no drama. In, out, and leave before they realise we're here. Yes?" "Sure," Sam nodded. "I can do that, easy." Bannok steeled himself. "No," he denied. "Sam, you stay here with Niettah. Watch the ship, make sure they don't steal from us while we're stealing from them." Sam's mouth dropped open in shock. "What?" he yelped, the sound too loud in the otherwise silent night. Niettah shushed him but he ignored her. "It's a stealth mission. Stealth missions are my thing, Bannok." Which was true. Bannok could do well enough, but Sam was on a whole other level, and had the added advantage that he could disappear underwater at any point. 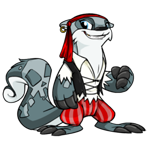 There were very few people who could catch a lutari at sea if he didn't want to be caught. In any other case, Sam would be the obvious choice. "It's too dangerous. If that's the Comte, then I don't want to risk any of us on this; more than likely we're walking into trap. But we don't have a choice." "We have a choice," Sam hissed. "The choice is to send you to get yourself captured and have to fight your way out, or to send me to sneak in and sneak out and rob them blind while I'm at it." Bannok shook his head again, keeping his voice steady and level. "They knew we went to the Teeth," he explained. "They probably know we've followed them here. If it does come down to fighting our way out then I stand a better chance of it." He carefully didn't mention the bad shoulder; Sam hadn't seen it, and hopefully Niettah wouldn't bring it up. Besides, it was well enough to move. It just hurt. He'd fought with worse before. "I thought the plan was to leave before they realise we're here at all, for which you need me." "Sammy," Bannok said, one step away from begging. "I need you here to work out the code on the maps. And if we need the code, then they do too - which means they need you, and sending you to their ship is giving them exactly what they want." Through all of this Niettah had been hovering to one side, shifting uncomfortably as the two brothers argued. "If you know it's a trap," she began, hesitant to interrupt, "why are you going on the ship at all?" "Like Sam said, we're a tiny ship. We've got no cannons, and there's only three of us." Bannok frowned, running the possible scenarios through his mind, but he kept coming back to the same thing. "We can't fight them, not without messing something up on their ship to give us an advantage. We can't stay here waiting, either. It's a small island, they're going to notice us soon enough. And we don't have the supplies; chances of finding fresh water here are too low." "So we move now," Sam picked up grimly. "They know we're coming, but they don't know when. Take the maps, run. Lie low and come back when they've got bored and moved on." Niettah raised an eyebrow at that, but Sam shrugged. "We've done it before. Pirates aren't known for their patience, and they don't expect people to do the cowardly thing." He smiled, though it was hardly a happy one. "Works to our advantage." "Sorry," Bannok felt compelled to add. He didn't quite know what Niettah expected when she joined up with a pair of pirates, but the truth was that they were survivors. A long way from the heroes people liked to write about, that she'd probably read about. "No, I understand," she said with an easy nod. "It makes sense. It's what I'd do." Bannok blinked, surprised. He supposed he shouldn't be though - he remembered her uncanny understanding of why Sam was so suspicious of her. The fluffy-headed Lady Antoinette she'd played back at the palace was turning out to be far more of an act and far less reality than Bannok had thought, he had to remember that. "Fine," Sam bit out. "If we're all being so sensible, then Bannok swims to the other ship and we stay here in the lovely toasty warm while he gets soaking wet and cold." Bannok couldn't help but laugh, partly in relief and partly at Sam's attempt to needle him. "I'm not going to swim," he said. "We never gave back the canoe, remember? And see if you can figure out the map puzzle, would you?" "Yeah yeah," Sam waved him off. "Go and steal stuff." Sneaking aboard the other ship was both easier and harder than Bannok had envisaged. He'd taken the canoe as close as he'd dared and swum the last part, a hollow tube acting as a basic snorkel so he could keep his head underwater. The pair of swords at his waist weighed him down, but he dared not leave one behind. He'd already had to leave his pistol behind as it was; the gunpowder would never have stayed dry. He had one of the amplifier guns with him instead, but although Sam and Niettah had tried to fix it, neither could be sure it would work. It was a last resort at best. Still, Bannok thought as he hauled himself up the side of the ship, he'd expected more of a guard than this. Had he been right? Was he walking into a trap? "Only one way to find out," he breathed, and swung himself over to land on the deck. He rolled, cushioning the landing into something near silent and getting out of the open in one movement. Once secure in the shadow of the mast he waited, holding himself up on his elbows and trying to calm his racing heart beat. One breath. Two breaths. Three. Silence. He'd made it onto the ship without being seen; all that was left now was to retrieve the map and go, maybe sabotage a few things along the way. He took a moment to get his bearings; from his hiding place, he could see two hatches, one laid flat into the deck and the other leading into the main cabin. He left the main cabin and slunk to the first hatch in the bow instead. It was locked, but Bannok had been picking locks for long enough that it didn't present too much of a problem. He slid his belt knife through the gap between the hatch and the deck and worked the catch free. It rattled quietly as it came loose and Bannok froze. His gaze flicked up to the crows nest where he expected the watch to be, but he saw nothing. The lack of people about was becoming suspicious. He pressed his ear against the hatch and fought the urge to go back to the Arkmite. One hand rested on the swords at his waist and he reminded himself that he knew full well this a trap. Whenever they sprung their ambush, they wouldn't find him unprepared. All he had to do was get the map first so that when the fighting started he could concentrate on getting himself out. Hearing no sounds from the room under the hatch, Bannok eased it open and lowered himself inside. He landed in a crouch, one sword already drawn and his eyes scanning the room for any pirates. Looked like he'd found the storage room. There were barrels and crates lined up against one wall, carefully stowed canvas sacks against the other. A chest built into one corner was glowing with faerie magic and protections. The cool box, Bannok assumed as he made his way for it. He trailed a finger across the top to confirm it and nodded when he felt the telltale roughness of ice crystals. Well. He was here to sabotage, wasn't he? The pirates wouldn't get very far without supplies, and the faerie spells keeping the food cold were easy enough to disrupt. He kept an ear out for footsteps and pried the silver crystal at the centre of the chest free. It dropped out with a whisper of magic and the glow on the chest faded. "Perfect," Bannok grinned, slipping the crystal into his pocket. Footsteps outside the room made him stiffen for a second. He spun on his heel, searching for a hiding place and darted behind one of the canvas sacks. Not a second too soon - the door to the room opened almost as soon as he'd hidden himself. He peered out between two of the sacks. It was a zafara, one of the pirate crew. He went straight for the crates, digging around in one and emerging with what looked like a bottle of some sort. "Spies and traitors," the zafara muttered to himself. "Pah." He spat on the floor in disgust and hefted the bottle with one hand. "No way to run anything. The White Horn would be ashamed if he could see us now." Bannok's breath caught. The White Horn? If the zafara had been part of the White Horn's crew, then what did that mean - was this the Gallant Steed, the White Horn's famous ship? Was the Comte somehow connected to all this? And that talk about spies and traitors. It confirmed what he and Sam had suspected, but it didn't answer the question of who was the traitor. Was it Harry? The kougra had seemed friendly enough, but she was the only other one who could have known what they were doing. Or was there someone else they’d missed entirely? Still muttering, the zafara made his way out of the room. Bannok crept after him, hiding in the shadows and using the sharp sounds of the zafara's own boots to disguise his soft footsteps. He peered surreptitiously into the rooms they passed, searching for anywhere the map might have been hidden. So far though these seemed to be the bunks; he saw hammocks, more storage rooms, one or two larger rooms. Nothing that may have been the captain's quarters. "Hey boys," the zafara said, turning into another room. A shaft of flickering candle light fell on the spot Bannok had been standing in just a second before and he hurriedly crouched down behind the door. "And girls!" one of the voices inside called. "Stuff it, Kay," someone else laughed. "You ain't no lady." The first voice - Kay, Bannok assumed - sneered an unlady-like response to uproarious cheers and approval from the others. Bannok looked down the corridor, trying to judge where would be the best bet to continue the search, when the zafara spoke again. "So, which part of Krawk Island are you going to rule over?" What? He crouched further behind the door, straining to hear over the din. "Me? I was thinking the forgotten shore. I mean, like, there must be a tonne of treasure waiting to be found." "Governor's mansion!" someone else declared. "You can keep your smelly sand, I'll be living it up in the high life." "Oy Vapad, keep dreaming!" a third voice jeered. "Rochefort's having that. If he doesn't bang it up too much in the attack, knowing him." "Bang it up?" There was the sloshing of some liquid, a tankard of some sort clanging down on the table. "Mate, once we have the horn back we'll do more than bang it up a bit. We'll flatten it. Drop the whole island to rubble if we have to." "You and your ruddy horn," the third voice said. "That thing's a myth and you know it. We're wasting our time here - nothing wrong with a bit of old fashioned cannon fire. We could take Krawk Island with a few well planted explosives, no need to go chasing faerie stories like this." A chair pushed back from the table and a hush fell over the group. Bannok held his breath, ear pressed against the wood. He didn't know what was worse, the idea that the Comte's crew - because this was the Comte's crew, if it was Rochefort aiming for the governor's mansion - was trying to conquer Krawk Island, or the idea that they had some secret weapon to do it with. "The White Horn isn't a myth," an old, gravelly voice said. "We hid it for a reason, and you would do well to remember. The Comte is a foolish man to want what his father has set aside." There was a pause. Bannok could almost hear the pirates trading awkward glances, none of them willing to be the first to speak up after that pronouncement. The old pet snorted once. "And you are fools for following him," he finished. Heavy, uneven footsteps marked his movement, and Bannok scrambled out of the way as the door swung open. It was skeith, his once-vibrant scales faded and worn, his face set in a permanent grimace. He looked down at Bannok, easily seeing through his attempts to hide. Bannok prepared himself to fight, but the skeith merely rolled his eyes and jerked his head to one side. Cautiously, Bannok fell into step beside him. "Little Ami sent you?" the skeith asked. Whatever Bannok had been expecting to hear that wasn't it, but he schooled the shock off his face and nodded. "Good." They walked a minute more in silence. Bannok almost choked on the questions he wanted to ask, but he stifled them. He didn't know what 'little Ami' would have told him or not (and wasn't she supposed to be dead? Or 'lost to us', as Niettah had put it?) and he couldn't afford to blow his cover like that. "You have my assistance," the skeith finally said. "Rochefort's ambition will see his father's legacy in flames. I want no part of it." "Rochefort is the White Horn's son?" The question slipped out before he could stop it and he bit his tongue as soon as he'd said it. To his relief, the skeith only smiled grimly. "The White Horn was the weapon, lad. Always the weapon. The man... There were several. But yes, Rochefort's father was one of them. The last of them." He barked out a dry, scraping laugh. "Somehow I'm not surprised Ami left that out." "No," Bannok agreed, hoping it was the right thing to say. "I'm not either." They'd reached the main hatch leading back out onto the deck and Bannok hesitated. He could hear voices on the deck. However friendly the skeith was being, whether he trusted the skeith or not, he couldn't afford to be seen on deck. The older pet looked over at him and nodded in understanding. "Get what you came for, lad. I'll be around." With one last nod goodbye he stepped out onto the deck. "The others got bored of your portents of doom, old man?" one of the two pets on deck called in snide greeting. "It's the right of the young to ignore the wisdom of the old," the skeith answered calmly. "And it is the misfortune of all to suffer the mistakes they bring." Bannok turned away from them. If he was right, then one of the two on deck was the captain - the Comte Rochefort, son of the last of the White Horns. White Horn wielders? It was a lot of information to take in. Amelie was alive - or at least, the skeith believed she was - and somehow working against the Comte, and Rochefort was planning to invade Krawk Island using the White Horn itself, the weapon that his father had gone to such great pains to hide that he'd split the map into nine pieces and scattered them across the globe. A lot of information. But it meant one thing for sure: they needed to stop Rochefort from reaching the treasure and finding the White Horn. Bannok left the skeith to weather the captain's insults and headed back into the ship. He had to keep looking for the map pieces - and he was pretty sure he'd seen the navigator's chart table on his way here. No maps. The navigator did have some notes though, and Bannok took the time to memorise them as best he could. It seemed that Rochefort had narrowed the treasure down as being under one of the islands many mountains; he just didn't know which. And, before he'd stolen the sixth map piece off them, he hadn't known which island either. But with the map pieces that Bannok and Sam had already collected, combined with Niettah's one piece and the information from the navigator's notes... Bannok had a pretty good idea which mountain the treasure was under. He just needed to get himself back to the Arkmite without being seen. He went back out of the storage room, preferring to haul himself up out of the front hatch rather than risk the captain spotting him by the main entrance. Retracing his steps took him back past the room where the other pirates had been drinking before. The room now was silent and empty, the door hanging open on its hinges; Bannok could only hope that the pirates had retreated further into the ship and weren't all gathered on deck where it would be hard for him to sneak past. He passed the barrels and chests and the cool box - not cool for much longer, now that Bannok had stolen the crystal that powered it. Climbing up to the hatch required a bit of shifting things around to create a pile tall enough for him stand on, but it was easy enough, even allowing for his bad shoulder. He eased it open just enough to confirm that the coast was clear and swung himself out, then lowered the hatch on his finger tips to cushion the sound. One last check to make sure the canoe was where he'd left it, and he prepared to lower himself overboard. A raggedy cheer from the stern caught his attention and he turned to look. Soon the other pirates joined until until the whole crew were shouting, stomping their feet and beating their fists against the air - it seemed as if every pirate on the ship was gathered to watch. Bannok glanced past them at what they could be cheering for. He froze. Horror swept over him. The Arkmite. The Arkmite was sailing steadily towards them, turning into the wind to moor alongside. Bannok had been right; it had been a trap all along. Just not a trap for him.